BITSAT 2019: BITSAT Slot booking will be started from 5th April 2019. BITS Pilani Application form has been released from 5th January 2019 and the last date of filling the application form is 20th March 2019. BITSAT (Birla Institute of Technology & Science) Admission Test, which is the popular Engineering Entrance Exam for private institutions. The university level examination is organized by the Birla Institute of Technology and Science. Exam is conducted by the BITS for providing admissions in to the various courses which are offered by BITS and its other institutes. The conducting authority will conducts it via online mode only. Students will get admission in engineering, pharmacy & science courses which are offered by the BITS’s institutions. BITSAT Application Form has been started via online mode. BITSAT Slot Booking will be started from 5th April 2019. BITSAT 2019 Application Form has been released from 5th January to 20th March 2019, Click Here to fill Application Form. CBSE has revised the Class 12th Exam Dates, Click Here to check revised exam dates. The authority will conduct the BITSAT 2019 Exam in two sessions, the first shift will be starts from 9:00 A.M to 12:00 P.M and second shift will be start from 2:00 P.M to 5:00 P.M.
BITSAT Exam consists of 4 sections, Physics, Chemistry, Maths and English and Logical Reasoning, Click Here to check BITSAT Exam Pattern. The Admit Card of BITSAT Exam will be available from 22nd April 2019, Click Here for more details about BITSAT Admit Card. The Result of the BITSAT will be available on July 2019. BITSAT Slot Booking will be Started from 5th April 2019, Link will Provide soon. 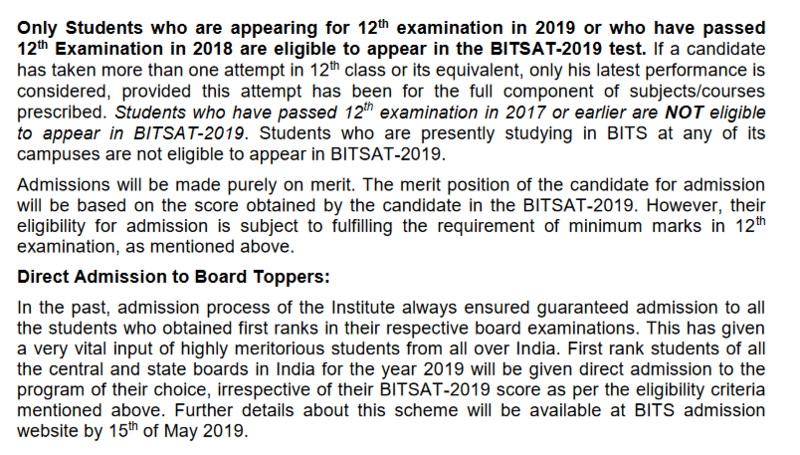 BITSAT 2019 Admit Card will be released on 22nd April 2019, Click Here for more info. Candidates can fill BITSAT 2019 Application Form till 20th March 2019, Click Here for more information. Online Application under International Admission Schemes has been released, the last date of filling the Application Form is 10th April 2019, Click Here more details. BITSAT 2019 Exam Dates has been released, Click Here to Check BITSAT 2019 Complete Schedule. The authority has been released the Exam Dates for the Exam, Candidates can Check here the BITSAT Exam Dates which are given in the tabular form, The exam will be held from 16th May to 26th May 2019. The Exam will be held in the various of the Exam Center in India as well as the outside of India. 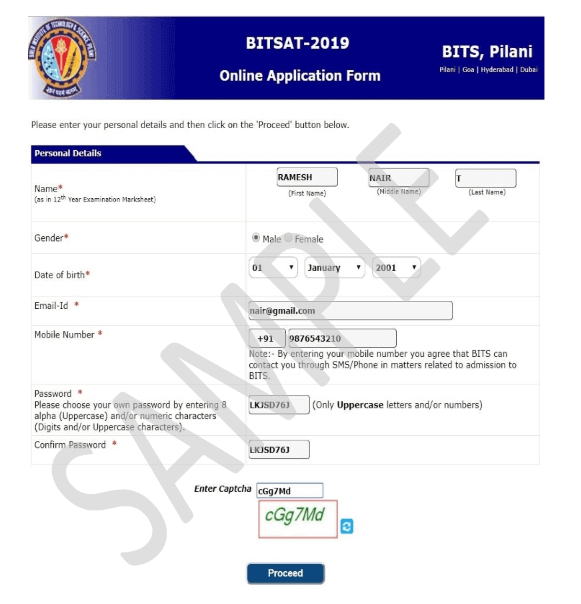 BITSAT 2019 Application form has been released now, Candidates can fill the BITSAT Application Form from 5th January 2019 to 20th March 2019. The BITSAT Application Form is available on the online mode only. Last Date to fill the BITSAT 2019 Application form is 20th March 2019. Candidates can fill only one application form. Candidates can upload Image only in JPEG/JPG format only. The Size of Image must be in Between 4KB to 50 KB and the size of Photograph is 1Kb to 30 KB. The Authority will also provide to BITSAT Application Form correction Facility to all the candidates. The Application form correction will be starts from 22nd March to 25th March 2019. Candidates can check from here How to fill BITSTAT Application form and Application fee applicable for different category. Visit the officially website @bitsadmission.com. Fill the required details details like personal details, academic details guardian details and education details like Name, Gender, DOB, E mail, etc. and submit it. It is advised to the candidates that please take a printout of acknowledge page for future purpose. A female candidates need to pay only Rs. 2450/- and for other category they need to pay Rs. 2950/-. Candidates can pay their application fee via online mode i.e. credit or debit card, net banking and offline mode by e-challan via Syndicate/Canara/ICICI Bank. Those who select Dubai as an exam center, need to pay US $ 70 (Rs. 4500/-) for both male & female candidates. 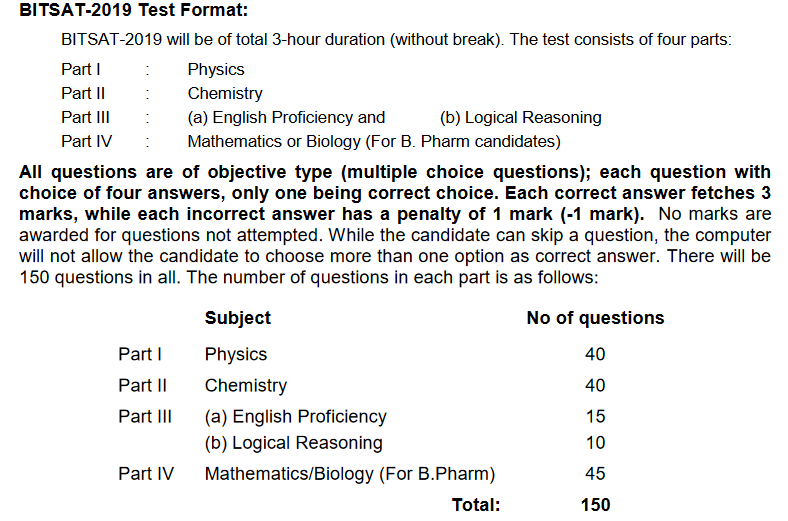 Qualification Eligibility (except B.Pharma): Candidates should have passed 10+2 or equivalent examination from any recognized board with Physics, Chemistry & Mathematics subjects. Qualification Eligibility for B.Pharma: Candidates should have cleared the 12th or equivalent exam from any recognized board with Physics, Chemistry & Biology subjects. Those who are appearing for the 10+2 also eligible. Percentage Criteria: Candidates should have obtained 75% marks in 12th examination with PCB/PCM group. Those who belong from the reserved category should have obtained 60% marks individually in Physics, Chemistry & Mathematics/Biology subjects . BITSAT Pilani may offers many of the courses such as B.E/B.Tech, B.Pharma, M.Sc, M.E, M.Pharma, and Doctoral Degree as well. How to Prepare for BITSAT Exam? Check your syllabus carefully and starts reviewing syllabus at starts of the preparation.. Distribute your equal amount of time according to the all subjects. Candidates need to select the best material for the BITSAT preparation. Solve a lot of previous year question papers. Attempt mock test which is designed by BITS. Its give you the idea about the exam pattern and difficulty level. Take a proper rest and be confident. BITSAT Admit Card will be released via online mode only. Candidates can download their admit card from 12th April to 13th May 2019. Only those can download their admit card who will successfully registered for BITSAT. A candidate who enter in the examination hall without admit card are not permitted to sit in the exmaination hall. BITSAT is one of the popular exam in India, the exam will be held atleast 50 Cities in India and an International City such as Dubai, UAE. Check below the BITSAT Exam Centers. Afte the few days of the examination, the authority will release the BITSAT Result, Candidates can check the BITSAT Result after the next day of the examination. The authority will be declared BITSAT Result through online mode. Candidates need to fill result form by entering their roll number on the website. Two merist list will be released, After the declaration of result. One is for B.Pharma course and other one is for other engineering courses. BITSAT Counselling Process is done in Online mode only. The First Step in Counselling process is filling the Application Form, Candidates fill the Application form from the Official website. BITSAT Application Form is available only in online mode. On the Basis of the merit list, selected candidates called for the counselling process. The Authority will release the Admit list with the waiting list. Through the merit list candidates can go for the counselling process with required documents. 10th & 12th Mark Sheet with the Passing Certificate. Caste certificate (if any) of the candidate. Those who are appearing or appeared for the 10+2 qualifying examination need to fill BITSAT Application Form. It is advised to the candidates that fill your academic detail as well as personal details in the form. The authority will allot the seats to the candidates on the basis of their marks and filled preferences. Once the counselling procedure is over then the merit list will be released for those who need to report their enter for admission.